Concey Bosco is the third participant in our Creatives Futures program for 2016. 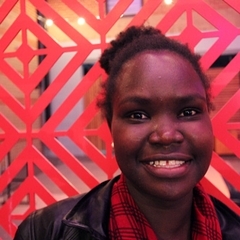 She worked as Assistant to the Production Stage Manager Gordy Rymer on the production of Who Speaks For Me?, a co-production between National Theatre of Parramatta and Performance 4A (now known as Contemporary Asian Australian Performance – CAAP). Who Speaks For Me was a unique production co-directed by Annette Shun Wah and William Yang in which three migrant and refugee families shared their personal journeys of moving to Australia and how language shaped their experience and sense of belonging. Here Concey gives us an insight on her work during the rehearsals of the production. I stepped in for Gordy for a couple of the rehearsals this gave me a responsibility in the rehearsal room that I liked. Gordy was very reassuring he gave me clear and specific instructions to ensure that I would be confident when I am in rehearsals. During those times I was included in conversations between the co-directors and storytellers. I felt I was also an important aspect of the team as an individual as well as the ASM. I hope to try my hand at directing one day and both Annette and William opened up my mind to rethink my method when interacting with non-performers background. There was a great amount of patience and trust needed from both the directors and storytellers that is transferred only by the truth of the work. I watched the storytellers discover new thoughts and approach while being guided minimally. I still cannot believe that I get the front seat as they journey through their past and reflect on their present which only resulted from the decisions that they made from their past and never thought of the future which is now. While we take a break from the journey I am blessed with the opportunity of hearing the untold part of their stories and their hope for the future I also share my own journey with them and they too would say, “You should also tell your story”. I never thought I would be working on a production that is so close to home. These stories are my parents’ and neighbours’ stories, stories of the people I pass by on the streets, they are relatable and those who can’t relate should hear them to understand. Click here to read about Concey’s experience working on the development of Who Speaks For Me?